This wil be Luis Enriqu’s third spell at the Club, having previously joined as a player from Real Madrid in 1996, when he soon became a firm favourite with the fans for his competitive attitude. In addition, his versatility, knack of scoring big goals and technical ability made him a key member of the team. In his first three seasons he won two League titles, two Spanish Cups, a European Cup Winners Cup and a European Super Cup . In his eight years as a player, Luis Enrique played 300 games and scored 109 goals and was captain from 2002 to 2004, when he finally hung up his boots as a player. 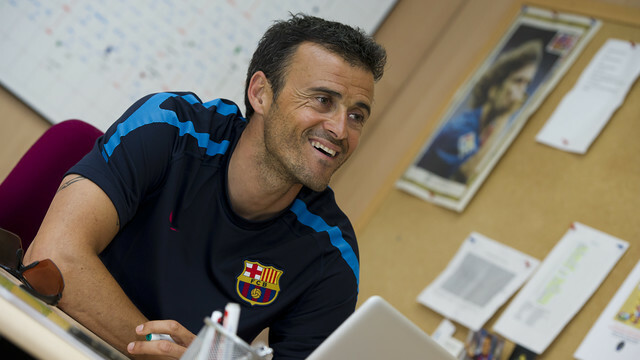 In 2008, he was back at the Club, taking over as coach of Barça B and after just missing out in his first year, he won promotion to the second division in his second, taking the youngsters to a record breaking points haul and finishing the 2010/11 season in third place.
.@LUISENRIQUE21 te deseamos lo mejor posible como nuevo entrenador del @FCBarcelona_es: adelante Luis!